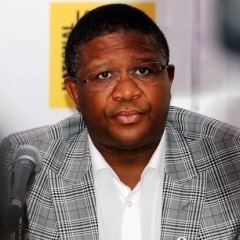 Pretoria - South Africa's Minister of Sport and Recreation, Fikile Mbalula, has expressed his deepest condolences after the passing of former Bafana Bafana and current Free State Stars striker, Richard Henyekane. Henyekane made nine official appearances for Bafana Bafana. Henyekane was tragically killed in a car accident in the early hours of Tuesday morning. “Henyekane’s passing is a great loss for our country and to the entire football fraternity," Mbalula said. "He comes from a family of soccer players as his brother, Joseph Henyekane was also a professional footballer. "Football in South Africa is poorer without him. On behalf of the government of South Africa, we send our deepest condolences to his family, to his other family, Free State stars and to all the football loving people of our country."